The transfer function model for the cruise control problem is given below. Please see the Cruise Control: System Modeling page for the derivation. The block diagram of a typical unity feedback system is shown below. The first thing to do in this problem is to find a closed-loop transfer function with a proportional control ( ) added. Recall from the Introduction: PID Controller Design page, a proportional controller, , decreases the rise time, which is desirable in this case. For now, use equal to 100 and a reference speed of 10 m/s. Create a new m-file and enter the following commands. 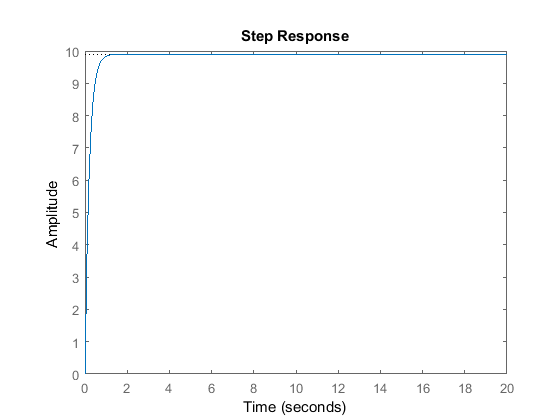 Note that we have used the MATLAB feedback command to simplify the block diagram reduction of the closed-loop system. Please verify for yourself that the result agrees with the closed-loop transfer function, T, derived above. 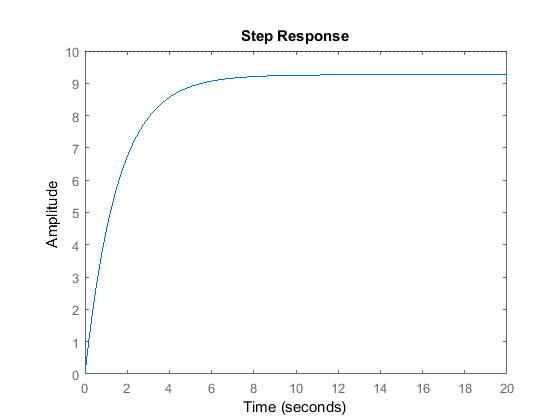 Running the m-file in MATLAB should give you the step response above. As you can see from the plot, neither the steady-state error nor the rise time satisfy our design criteria. You can increase the proportional gain, , to reduce the rise time and the steady-state error. Change the existing m-file so that equals 5000 and rerun it in the MATLAB command window. You should see the following plot. 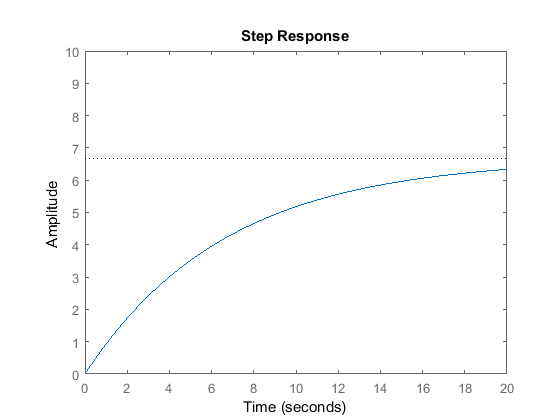 The steady-state error is now essentially zero, and the rise time has been reduced substantially. However, this response is unrealistic because a real cruise control system generally can not change the speed of the vehicle from 0 to 10 m/s in less than 0.5 seconds due to power limitations of the engine and drivetrain. Actuator limitations are very frequently encountered in practice in control systems engineering, and consequently, the required control action must always be considered when proposing a new controller. We will discuss this issue much more in subsequent tutorials. The solution to this problem in this case is to choose a lower proportional gain, , that will give a reasonable rise time, and add an integral controller to eliminate the steady-state error. Recall from the Introduction: PID Controller Design page, an addition of an integral controller to the system eliminates the steady-state error. For now, let equal 600 and equal 1 and see what happens to the response. Change your m-file to the following. Let equal 1, equal 1, and equal 1 and enter the following commands into a new m-file. 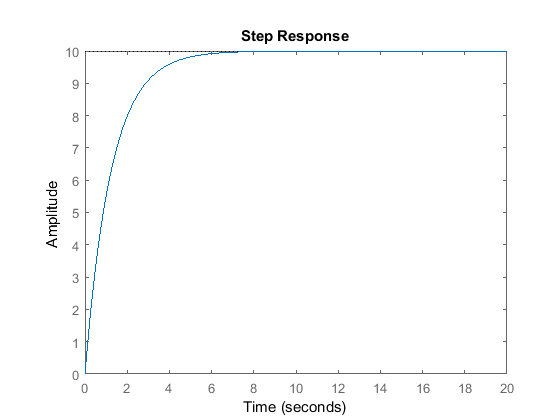 Plot the step response and adjust all of , , and until you obtain satisfactory results. We will leave this as an exercise for you to work on. Suggestion: Usually choosing appropriate gains requires a trial and error process. The best way to attack this tedious process is to adjust one variable ( , , or ) at a time and observe how changing one variable influences the system output. The characteristics of , , and are summarized in the Introduction: PID Controller Design page.